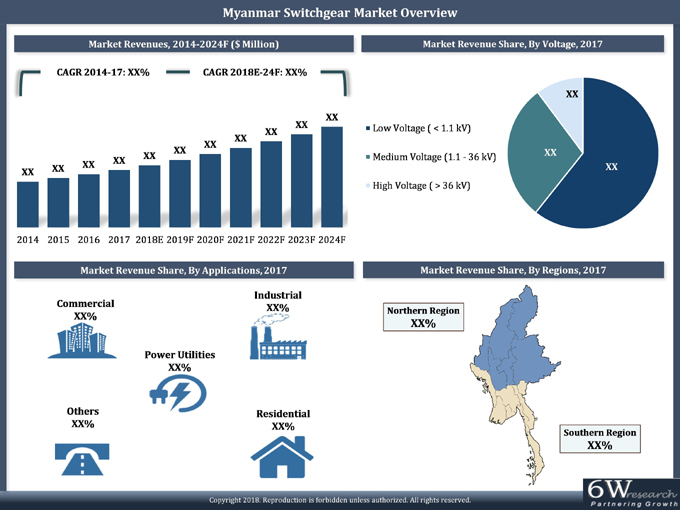 Construction of ambitious infrastructure projects, initiatives to expand the power transmission and distribution network along with the development of the residential sector to keep up with the rapidly growing population would be some of the key drivers behind the growth of Myanmar switchgear market during 2018-24. Government plans such as the National Energy Plan 2030 and the National Transport Master Plan 2030 are expected to further boost the demand for Myanmar switchgear market over the coming years. Due to widespread applicability across the residential and commercial sectors, low voltage switchgears dominated the overall Myanmar switchgear market share in 2017. Presently, air insulated switchgears are more widely used in the medium and high voltage categories while gas insulated switchgears are expected to gain more market revenue share over the coming years. The Myanmar switchgear market report comprehensively covers the market by voltage, insulation, types, applications and regions. The Myanmar switchgear market outlook report provides an unbiased and detailed analysis of the Myanmar switchgear market trends, opportunities/high growth areas and market drivers which would help the stakeholders to device and align their market strategies according to the current and future market dynamics. 13.8 Asia General Electric Co. Ltd.
13.9 Khin Maung Nyunt Manufacturing Co. Ltd.
13.10 Super Mega Engineering Co. Ltd.